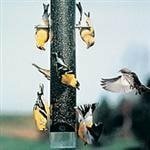 Why Have Birds Stopped Visiting My Feeders? I'm often asked why birds have stopped coming to their backyard feeders. It may even be more specific, such as; why have the Goldfinches stopped, or some other species. The reasons can be as varied as there are birds. Sometimes it's due to predators showing up. These bird predators could be; cats, hawks, Owls or other animals and birds. Understanding bird behavior when it comes to feeding will help you understand why they've stopped showing up. Birds are in constant search of food sources. Surprising to many birdwatchers is the fact that some of the birds you see at your feeder in the morning, may not be the same birds you see in late afternoon. The types of food available can influence why birds may not be showing up at your feeders. Inexpensive seed varieties contain seed such as white millet which doesn't attract many songbirds. Offering these types of seeds will attract House Sparrows which will keep more desirable birds away. House Sparrows can be very aggressive at feeders and are considered a pest species. Natural food sources seem to be preferred by most birds. When winters are mild or during summer, birds will have more natural food sources available. 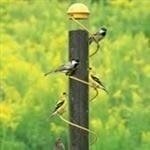 When this happens, bird feeders are used less. Always on the lookout for food is a survival tactic of birds. They've learned to never rely on a single source for survival. Those species that have a very specific diet are the ones you'll see on the endangered list. We've identified three reasons for bird feeders being empty of birds, They are: Predators, seed varieties, and natural food sources being available. A forth reason may be that your neighbors have started feeding birds and feeding them well. 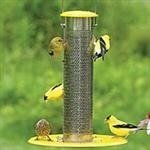 Offering a bird feeding station filled with Black-oil sunflower seed, nyjer seed, suet, peanuts and more will draw more birds than a single feeder with one type of seed. Given a choice, it isn't difficult to see where the birds will be feeding. By using the term neighbors, I don't mean next door. Birds travel great distances during the day getting to all their food sources. So don't assume because none of your close neighbors are birdwatchers that you're the only source of food. That perfect site may be a mile away. Sometimes it's as simple as waiting out the weather or changing and offering more food choices. 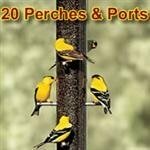 As it gets colder the birds natural sources become less available and your feeders become more attractive. Provide Water! Many people forget the birds need water to survive. A Heated Birdbath will give all the birds in your backyard a chance at survival And maybe an edge with other birdwatchers. Predators can be difficult, but with a little effort they can be defeated also. You may have to be a bit creative but you can do something about controlling predators.